There is no joy like the one of feeding your cat and seeing it enjoy your love. Some of the best cat memories for mostowners are when their cats come running towards them and meow for food. But such happiness may distract them from the fact that their cats have weight problems. As cats get overweight, the joy suddenly disappears and worries set in. We’d like to help you get rid of those worries and bring the feeding fun back by introducing our reviews on best cat food for weight loss. Why Should You Choose Cat Food For Weight Loss? Cat food specially made for weight management differs from ordinary food in one major nutrient – carbohydrate. Contrary to popular belief, carbohydrates do not directly cause fat to build up in cats. What we need to investigate when discussing carbohydrates is their impacts on protein levels within a diet. The more your cat consumes carbs, the less protein it can absorb. But protein that plays a major role in supplying cats their energy for all of the activities. Felines have evolved to use fat and protein rather than carbs for energy requirements. They do not need more carbs in the diet. So, cats being fed insufficient amounts of protein are likely to lose their muscle mass. Lean muscle being lost through an inappropriate diet means that the metabolism rate will lower and the matter of weight gain will worsen. Food made especially for weight management usually have lower amounts of carbs and higher amounts of protein. Every brand has their specifications, but overall, they follow the same pattern of reducing carbs. That’s why you should look for food designed to treat weight issues. Ordinary weight loss cat food does exactly the opposite of what is good for your furry friend at home. It features high amounts of carbohydrates and fiber. It also tends to have a low-fat content. Such diet seems to work because it can help cats get thinner. However, there is the good “thin” and the bad “thin”. Just like humans, if cats do not lose weight in the right way, there are serious problems. A diet of high carbohydrate causes them to lose what they shouldn’t lose at all, and that is lean body mass. Lean body mass is crucial for energy metabolism. 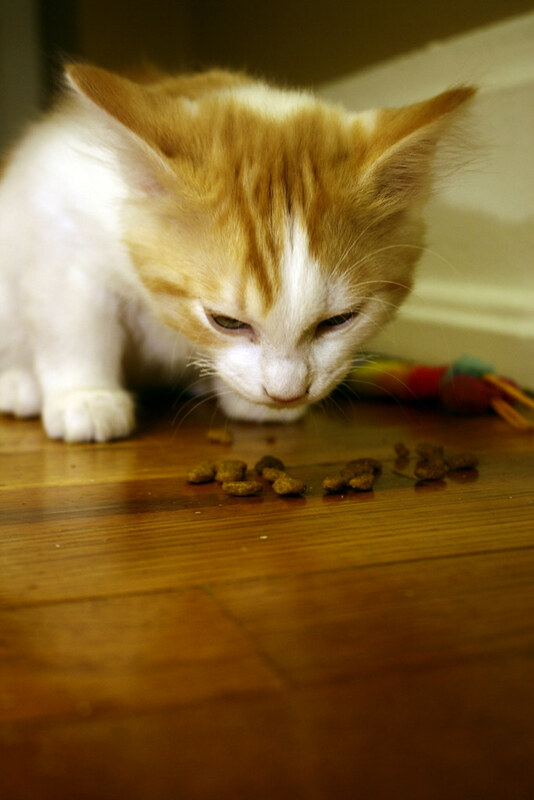 Without it, cats get the empty stomach feeling even after they eat. They just can’t get the full feeling that satisfies them. This causes the problem of overeating since their appetite is not satisfied. No matter how super your cat food for weight loss is, your feline friend is likely to continue gaining weight if you keep the same pattern of free choice feeding. It is very considerate of cat owners to leave full bowls of food around the house and let their beloved felines have the freedom of eating or grazing through the day. However, some cats just do not have the common sense of enough! They will eat until they can barely walk to the food bowls because they’re too fat. As shown before, a high carb recipe is unlikely to produce the weight effects you want for your cat. And cats actually don’t need that much carb in their diets. What they need as a vital source of energy and muscles is high-quality protein. A diet low in carbs and high in protein helps cats lose weight and maintain their body mass at the same time. This is the healthy way to get thinner. Furthermore, high protein diets also satisfy cats’ appetite. You want your cat to lose weight, and you don’t want it to over-eat again because the high carb diet cannot satisfy it. So it’s best to go for the high protein, low carb diet. Cat owners are becoming increasingly aware of the unacceptable drawbacks of processed cat food. It’s just common sense, isn’t it? Anything processed is not as pure and as good anymore. For cat food, many of essential nutrients are lost during the processing stage. Actually, when processing food at high temperatures, you destroy most of the nutrients. Manufacturers have to add nutrients to the processed food to compensate. But not everything can be recovered. Therefore, you can say processed cat food, which is basically most of the food on the market today, cannot compare to a raw diet. Raw diet – one that tries to model wild meat, has amazing proven health effects such as weight loss, enhanced digestion, healthy coat, more energy, good dental and urinary health, weak stool odor. Hill’s Science is famous for many top-quality products that cover a wide range of pet needs. This special cat food for weight management is one of them. A thorough study in 2011 showed that this recipe helped more than 70% of felines lose their weight in just 10 weeks. The reason behind this immense success is a breakthrough in nutrition exclusive to Hill. This special formula aims to put adult cats in a perfect weight range. 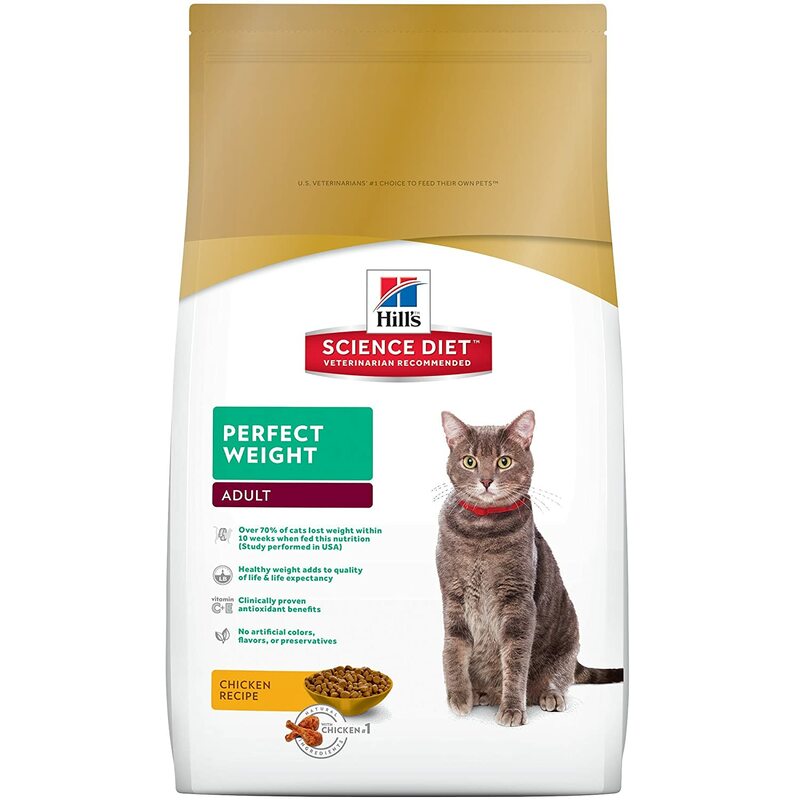 For cats that have gained some extra pounds, this food is the perfect choice for cutting down weight and maintaining a perfect body shape. Feed this to your cat and you can rest assured knowing that your beloved furry friend is getting the most natural and wholesome ingredients. Packed with essential vitamins, minerals, amino acids and antioxidants, the product is designed to enhance overall body functions. There are absolutely no preservatives or artificial flavors in the food. The first ingredient in the food is 100% real high-quality chicken for maintaining lean muscles. It means your cat can be strong and in good shape at the same time. The manufacturers conducted a test on an exclusive antioxidant blend and found out that it boosted the immune system in a wonderful way, preventing cats from falling prey to illnesses. Some cats may be unfamiliar with the taste and smell. This is one of the best cat food for overweight cats on the market that is brought to you by NUTRO – a renowned brand known for its commitment to feeding 100% clean diets. 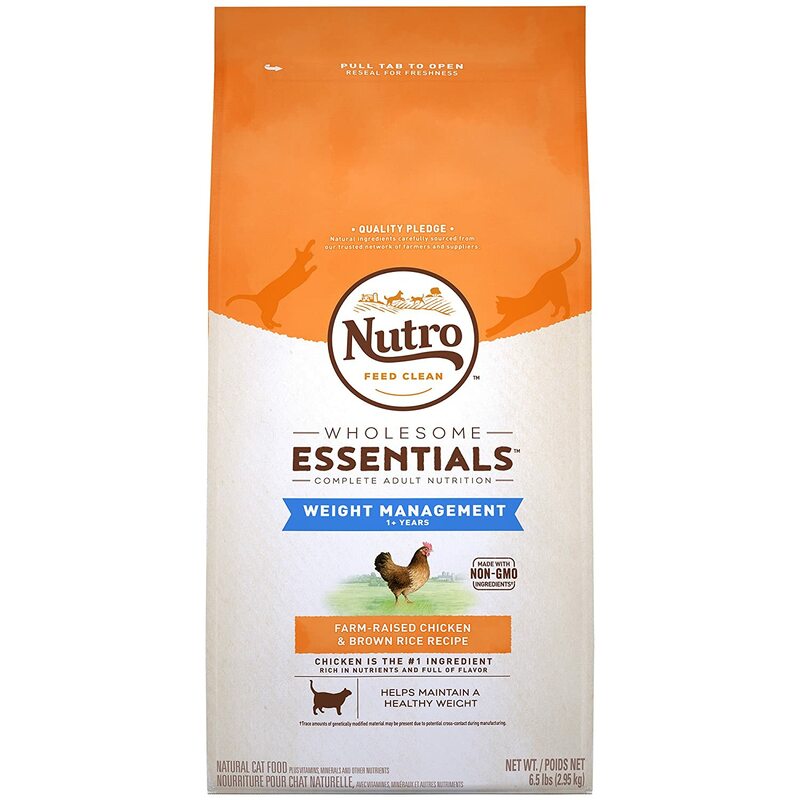 The food has 28% less fat as well as 13% fewer calories than the standard NUTRO wholesome essentials products. Thanks to reduced amounts of fat and calories, it is effective in helping cats lose weight. Not only is this food an excellent choice for weight management, but it is also popular for nutritious ingredients. Your cat will get all of the essential antioxidants to boost the immune system. Also, the food is packed with Omega 6 fatty acids to give cats the best-looking skin and coat. Chicken is the 1st ingredient in this product. The brand has partnered with the most trustworthy farmers and suppliers in the US to work on the best ingredients. The farm-raised chicken offers high-quality protein that has a great taste and enhances the building of strong muscles. There is no chicken by-product meal nor artificial flavors. NUTRO is one of few brands in the world that prides themselves on using non-GMO ingredients. There is no corn, wheat or soy protein in the food. Some cats may be unfamiliar with a recipe high in protein. Customers should check expiration date because incidents have happened. This product is for those searching the best wet cat food for weight loss. Purina has made a name for itself as one of the most prestigious brands in the world of pet supply with specialized diets. 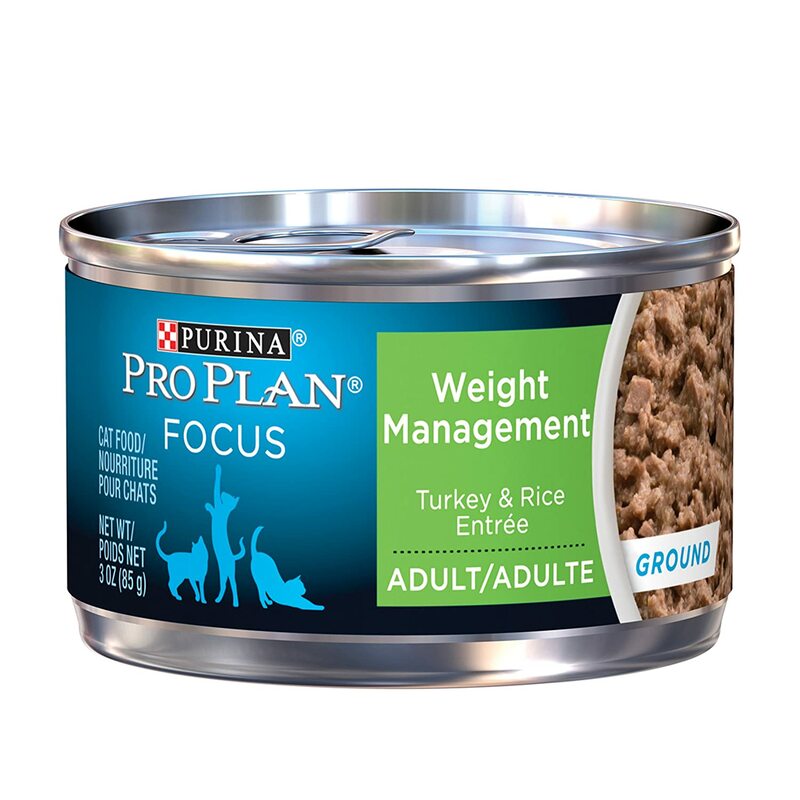 For weight management, Purina has a unique recipe that promotes optimal protein level to help cats build muscle and stay lean. Besides, the product is designed to enhance cats’ overall health. Antioxidants help to boost immune system. Omega 3 and 6 fatty acids help your cat’s coat shine in the most glorious way. Turkey and brown rice are a wonderful combination of taste. Customers have responded very well to the product. Those with cats allergic to chicken recipe are particularly happy to find a wet cat food that does not contain chicken. The food has also been reported to work well for felines with urinary tract complications. Most cats put on this diet produce good looking stools that are easy to clean up. The food dries up fast once exposed to air. Broken packaging has been reported. Hill’s Science has earned its place countless times in our review lists for good reasons. 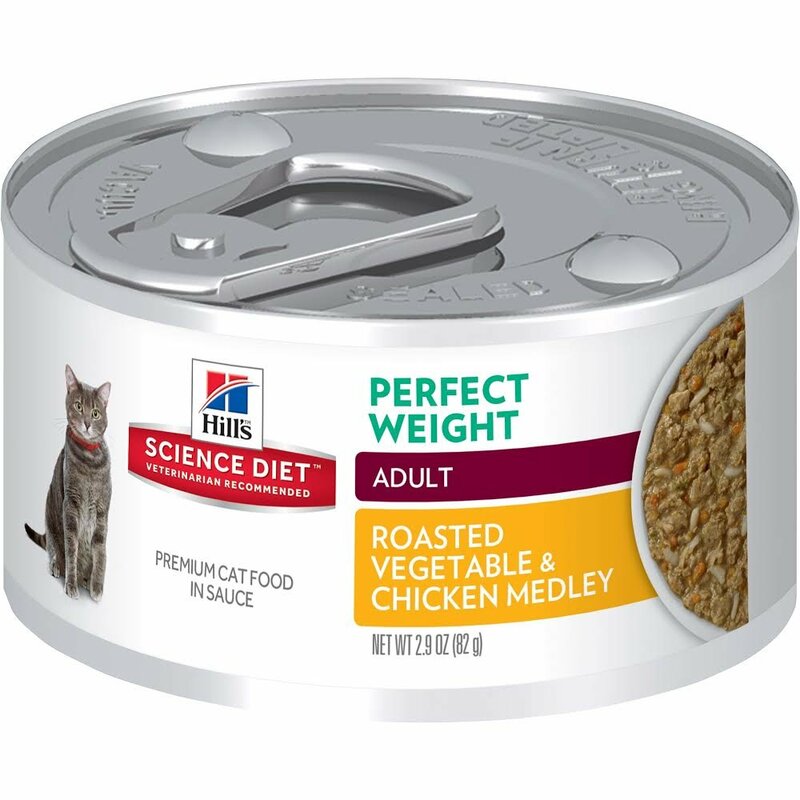 If you’re looking for wet food that can alleviate your cat’s weight problems, you must consider this. Hill is the home of over 220 certified veterinarians, professional pet nutritionists and scientists who have been devoting their love, passion and knowledge to creating the best pet supplies. Their products, including this food, are designed in the best interest of your cat. Hill is the expert in producing balanced diets that focus on one area of health issues. For weight control, this recipe is designed to give cats a perfectly balanced diet while reducing the amounts of fat and calories consumed. High-quality chicken protein helps cats form strong muscles and keeps them in a standard weight range. All Hill’s foods are produced with the finest ingredients either imported or made in the US. Your cat will enjoy the most natural ingredients, vitamins, minerals and essential amino acids for optimal health. For this wet cat food, a study has recorded more than 70% of cats on this diet went from being overweight to being perfectly fit in just 10 weeks. The product is a great choice for households with multiple cats of various weights as well as breeds. There is more grain protein than animal protein. The product has a strong smell. 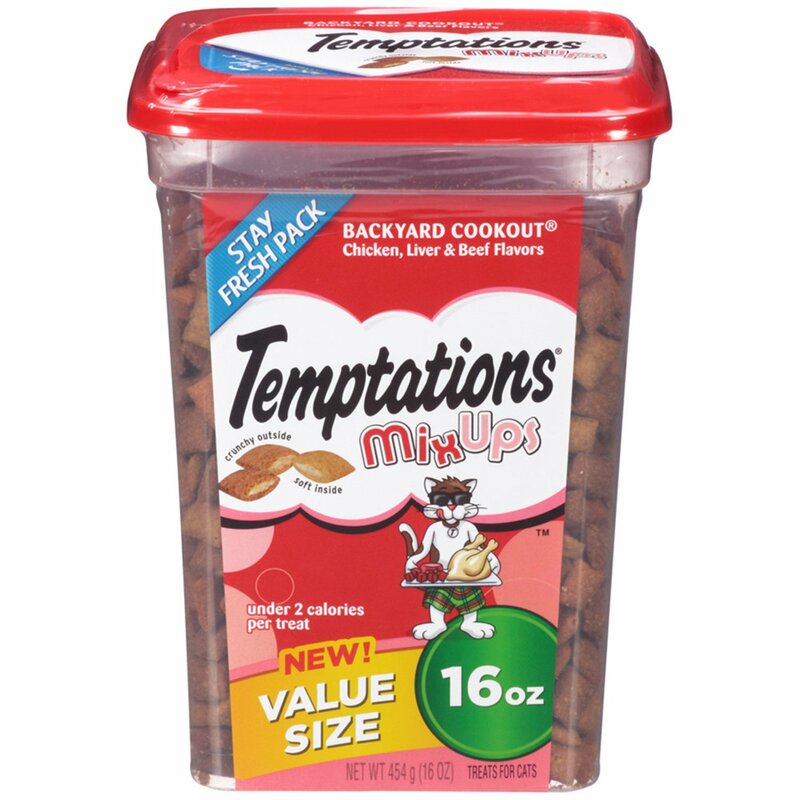 Many people associate Temptations with the best cat treat brand in the world. Actually, their sales data have already proven they are the best cat treat manufacturer in the entire USA. We feature cat treats in our review for the sake of variety as we know many of our readers are looking for not just a main diet but also treats that can help with weight control too. What sets Temptations apart from other treats is a number of calories contained in a treat. There are only 2 calories within a treat, which means you can feed your cat a lot of these in a day without worrying about weight gain. But make sure you let your cat play while eating a treat to release the energy. The recipe of this treat is another special feature. This product offers amazing mixed flavors of liver, chicken and beef. With this awesome new taste, your cat won’t ever get bored. Besides, the food has a lot of nutrients that your cat badly needs. This product features a 100% balanced formula that takes care of cats’ various health aspects. It has been proven to meet all the nutritional levels established by AAFCO Cat Food Nutrient Profiles. Cats that are unfamiliar with the mixed flavors might puke. The food package may not seal tightly so customers should check twice to make sure it’s sealed. Nowyou’ve got the knowledge, tips and most suggested products on the market. It is important for us to know that you have been helped properly. So, feel free to leave your question below. Meanwhile, we’d like to suggest our own pick – theNUTRO Specialized Care Adult Dry Cat Food. It has a perfectly high amount of protein, much less fat and fewer calories, all of which are important for your cat’s weight loss. Plus, the brand uses clean non-GMO ingredients to minimize processing. And it’s dry food! Many people shy away from wet food because it tends to be more expensive and usually has strongodor.